Many consider her a “Throw-Back” from the old days of Classic Hollywood when performers were entertainers with multiple talents and a dazzling personality to match. This exotic and beautiful singer, actress, and producer is a rare diamond that shines like a Star. She is no stranger to the entertainment industry and has already accomplished many of her goals. She was born and raised in Kansas City, Missouri where she studied Voice Performance and Theater at the UMKC Conservatory of Music. 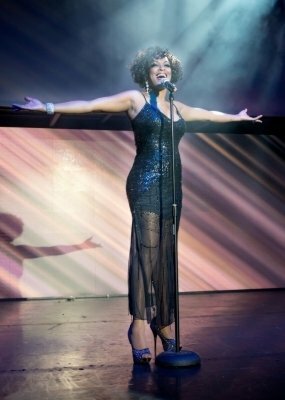 She has appeared on such shows like The Grammy’s, Oprah, the MTV Music Video Awards, the BET Awards, and the American Music Awards to name a few, and has also graced the stage with iconic entertainers ranging from Barbra Streisand to MC Hammer, Michael Bolton, Valerie Simpson, Smokey Robinson, Martha Reeves, and Marilyn Manson to The Family Stone. As a recording artist, she was featured on MC Hammer’s “You Can’t Touch This” album and is currently writing and co-producing her debut album, titled “Gemini Twin” featuring rock and funk-infused tunes like “In Your Face”, “Delicious”, the self-titled “Gemini Twin” and soulful, smoothed-out ballads like “Missing You”, “To Know Love” and the recently released single “Over Due“. She also has many film, television and theater credits under her belt as well. Appearing in projects like “Anchorman” starring Will Ferrell, “Breakin All The Rules” starring Jamie Foxx, “Bringing Down The House” starring Queen Latifah and Steve Martin, and the Off-Broadway theater productions of “Dreamgirls”, “Ain’t Misbehavin” and “The Wiz”.